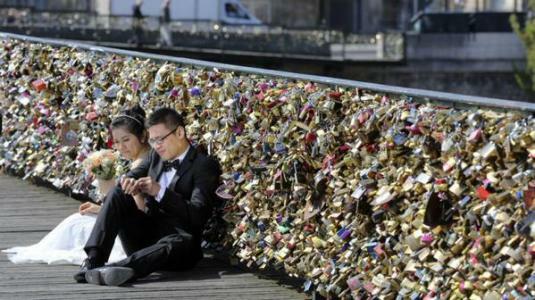 Sorry romantic lovers heading to Paris, the Love Lock Tradition is about to be wiped out. The city of Paris has decided that to end the tradition of tourists coming over and dumping bits of metal all over its bridges, starting from Monday, the padlocks will be removed from the Pont Des Arts & plexiglass panels will soon replace the grills. The Pont Des Arts has been the most popular bridge with up to 1 million locks thought to be attached to the railings. The City has however had enough. According to the council in charge, the locks are causing ‘a lasting degradation of the heritage of Paris and also a risk to the safety of visitors. This is somehow Justifiable because a part of the 'Pont Des Arts' collapsed sometime ago due to the weight of metals attached in the name of love. Awwww! That's an injury and accident for romance o. Arrrrrrrrgh! Many love will be broken. Many love will be broken o! Na when Ebuka go put him own, dem know say dey wan comot am. Hehehe how I wish they stayed locked down in love like the padlock. All manner of bizarre practices everywhere, it's Good the scrapping the practice. All manner of bizarre practices everywhere, it's Good they're scrapping the practice. Make dis tin no go scatter people love wey dem don lock o! Oya, Ebuka na Cynthia, start praying! Ebuka ur head no get oil? Go wash am for river osun! Na wen u do ur own na e dem remember say d tin dey degrade dia heritage? Can they just wait an extra year, when Lindz would go with the love of her life? Why naw? Wen I was planning to go drop my own love padlock over der. Is d strongnest of d love dt is pullin it down not d iron locks lol! No more lovelocks for new lovers....kinda sad. Well at least I can say I saw it while it as there. Some panels fell off because of the weight of the padlocks and were replaced with wood panels. People signed all over the panels too. Oh no! When I was still planning my try there. Linda take note! Good and progressive action. Paris will always remain the romantic city of love (at least in its history). Hahaha Ebuka sorry o!... 😜. What's even the essence of the stupid lock anyway when statistics has shown that the marriage doesn't even last up to a year.. All these stupid lockers should go and sleep! Does that mean the end for those that put padlock? So ebuka can still be mine? Lmao! I thought i was d only one irritated by d love lock thingy. If r/ship is meant to last, it will lock or no lock! Chai... just after Ebuka and Cynthia locked their love there!!! The visitors should not worry and come to Onitsha Niger bridge , it can accommodate billions of keys. oh nooooo.. I dreamed of placing a lock with my husband some day.. Too bad.. Laugh wan kill me. See the I'll luck Nigerians have. It is that Ebuka guy who caused this. His padlock brought this mayhem. Now all the padlocks will be removed. Even Kourtney with Scott's and Mason. Ebuka the presenter, look what your I'll luck has caused the world. Stay in Nigeria, you won't hear. Ya'all shud learn to go to the house of GOD to do this!!!! Paris railings won't save ur marriage! Was it not days back Ebuka and his fiance visited Paris nd made their own lock?Chei! Oya romantic couples shld device another means tos showcase their love.Na niger ppl like us still dey do our own.We will get to that Yankee level soon hehehe. Before they clear it.. Lemme go visit lol! Can't believe I live in pAris but never been there. Na only wen e reach Naija Lovers turn, na im ds kind tin dey happen... Ebuka N Cynthia, I'm sure U both did d worst wen U got dia... Did I Just Comment ??? Surprised it took them this long to come to this decision. I read an article pointing out that the weight of the locks could lead to the collapse of the bridge. Good for them, and they knw best thereof y they want it to b so. Oh no just not when we're abt to visit. Love- Locks & War- Locks...ain't these two so connected to satanic strongholds???*&%? You can as well channel all these energy you expend on hating lovers into being a better person. You sound single, God loves you though. Ur post cracked me up! Lmaooooo. Ebuka is in soup, I hope his love to Cynthia wouldn't be broken after d padlocks are broken. Una no go do ur things d godly way now Paris love can't save u.
Ebuka and his fiancée jst brought ds bad luck. Sure him own go reach 1 month? I'm sad. Was hoping I will do it with my husband one day. Saw it first on Kim and Kourtney takes the Hamptons. Lol but true love is more than a padlock so. Make we start our own for naija nau hehehe would be fun tho!